On July 18, 2009 our beloved father, grandfather and great grandfather was called home to spend eternity with his Father in Heaven. He lit up the world with his wit and intelligence for an amazing 95 years. 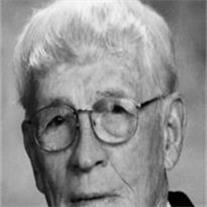 He was born on May 27, 1914 to David H. and Adelia (Horrocks) Cameron in Toole, UT. He grew up in Salt Lake City, UT. Dave was proud to have been a Naval Aviator. He entered the service of his country in early 1942 and served throughout World War II and Korea. He had a passion for flying. He learned to fly as a civilian in the late 1930’s in the Washington D.C. area and since he already knew how to fly when the War broke out, he quickly earned his Wings and was ready to contribute to the War effort. Dave was initially assigned to be a flight instructor in Pensacola, FL. Next he was sent to the West Coast and began flying transport /supply aircraft in the Pacific Theater. He flew all over the world during his time in the Navy delivering supplies to front line troops; then returning with injured soldiers and sailors as well as civilians and dependents fleeing the conflict. He crossed the Pacific in his C-47 and DC-6 countless times and had many hair raisingstories about his experiences. He was discharged after his service in the Korean War and enjoyed a long and successful career as a commercial airline Captain. He retired at the mandatory retirement age of 60 from Northwest Airlines in 1974. He was the father of three children. Leslie (Don) Oldham of Spanish Fork, UT., James (Janet) Cameron of Prescott, AZ., and Deborah (Randy) Mecham of Orem, UT. He loved and was loved in return by his 12 grandchildren and 25 great grandchildren (with one on the way). In retirement he lived in Sun Lakes, AZ. and enjoyed many years of playing golf and flying his aerobatic airplane. He was preceded in death by his brother Warde (Virginia) Cameron and his sister Dorothy (Jack) McClaren. In recent years, he and his wife Irma (Kitty) worked tirelessly in the Mesa LDS Temple and belonged to the Pleasant 1st Ward in Chandler, AZ. All who knew him loved him – and all who loved him will miss him. He was a man of honor who loved his family, his country and his church. Visitation will be at the Pleasant 1st Ward Chapel at 800 W. Chandler Heights Blvd. at 11 AM Thursday July 23, 2009 with Funeral Services at 12:00 Noon. Dave will then be transported to Salt Lake City where there will be a visitation Saturday, July 25 at 9:00 AM at Larkin Mortuary followed by graveside services at the Salt Lake City Cemetery at 10:30 AM. Arrangements by Bunker’s Garden Chapel, 480-696-6883.